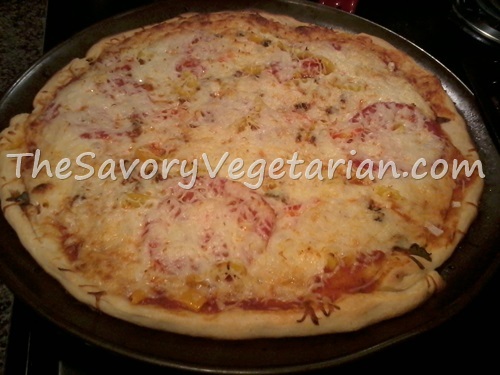 This quick and easy vegetable pizza recipe has become our go to meal when we want something super fast and super tasty. Using a pre-made refrigerated pizza crust makes it a breeze to prepare and it tastes loads better than one of those frozen cheese pizzas. Use your favorite pizzaria as inspiration and get creative with your toppings. You're sure to find a few different combinations that light your taste buds up. Preheat your oven to 450 degrees. Spray a large flat pan or an 11x13 inch baking dish with non-stick vegetable oil spray. Spread your crust out and press into the pan to flatten it out somewhat evenly across the surface of the pan. If you are using an 11x13 inch dish, press the dough up the sides of the pan to create more of a deep dish crust. Spread 1/2 c sauce even over the dough. 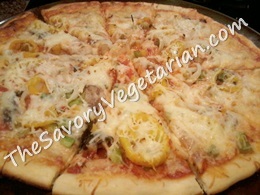 Top with mushrooms, green and red bell peppers, banana peppers and onions, spreading each in an even layer over the crust. Add the tomato slices and top with mozzarella cheese. Toss it in the oven and bake for about 12-14 minutes, until the crust is golden brown, the cheese is fully melted and the vegetable toppings are heated through. Change up your ingredients often to keep it fresh and ever changing. You won't get too tired of any one variation if you do it this way, and it makes your life a little easier in the kitchen. Need more vegetable topping suggestions?